We had a fantastic visit to Minety CE Primary School were several volunteers spent the day with the students. We had a lot of fun with each class discussing all aspects of Romans and coins – from the geography of the Roman Empire, to the value of coins, and we even had a go at learning Roman numerals. We really appreciate all the help and support from the teachers, especially headteacher Mrs Greaves, that helped make it so special. The work doesn’t stop with the cleaning of the coins. The volunteers regularly immerse themselves in the fun of recording, photographing, and identifying the coins. Wiltshire Conservation Services have been hard at work cleaning and conserving the coins – a very intricate and time consuming process. But one that is yielding terrific results, both for the appearance of the coins and for their preservation and protection from corrosive elements. Here is one coin with photos side by side of the obverse (front) of the coin and reverse of the coin both before and after conservation. The informational exhibit and panel about the coin hoard in the museum has been refreshed. 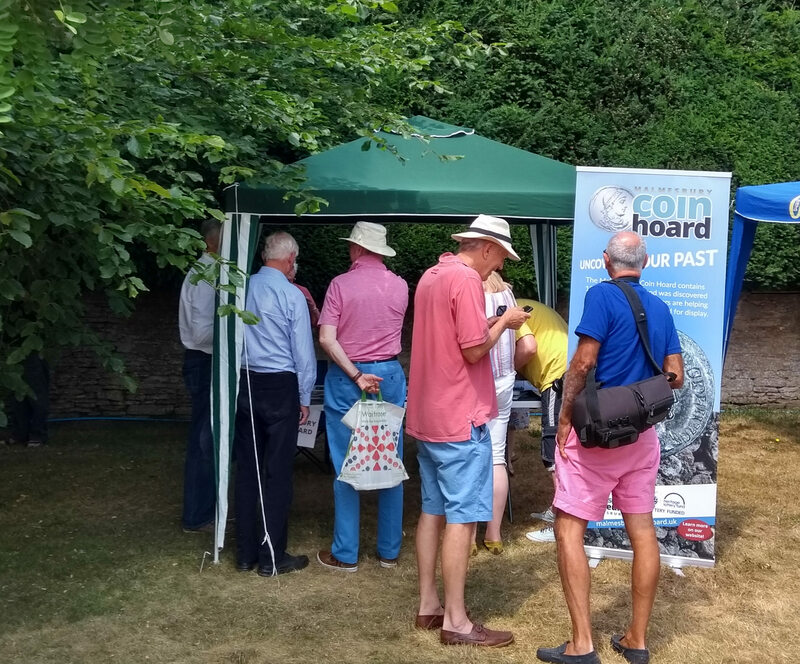 Stop by to have a look at the small hoard of 30 Roman coins found in the same area some years previously and now moved to a more visible location. These coins weren’t fortunate enough to be in a pot and you can see damage caused by time and the plough. Visit our main Athelstan Museum site for all the latest museum events. A group of volunteers were able to spend an afternoon out in the sun having a try at metal-detecting with our experienced teacher. The experience gave us a real feel for how much patience it takes to find an artefact. We were very excited to find a 100 year old penny or a buckle even if they were planted :) Thanks mimzy! It was fantastic to have a professional conservator from Wiltshire Conservation Labs Chippenham in the museum last Thursday and Friday working on our Roman coins and speaking to visitors about how the coins are conserved. They also brought along some x-rays of the coins to view. There was also added fun of the x-ray game run by one of our volunteers! It was great to see so many people come by. On Saturday, 14th of July we’ll be holding an open day at the Strawberry Fayre in Crudwell from 10am to 4pm. This is a wonderful chance to see some of the coins, including ones that have been conserved, and to learn more about the hoard.